Just days after signing for Celtic, Olivier Kapo has revealed why he opted for a move to the SPL, when an offer to play in the Bundesliga was on the table. 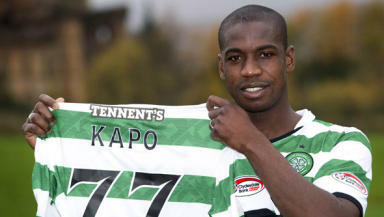 Kapo has made no secret of his immense pride at joining Celtic, and has cited a special ‘connection’ as one of the main reasons for joining. The 30-year old winger officially signed for Celtic on Thursday, but had attracted firm interest from the German mid-table outfit Freiburg. Despite usually featuring on the left side of midfield, Kapo has insisted that he is versatile and is happy to put a hard shift in for the benefit of the team.